The Georgia State men’s basketball team had a shaky start against No. 3 seed Houston in the NCAA Tournament on Friday night. The underdog Panthers trailed by as many as 14 points in the first half of their Round of 64 game. Devin Mitchell heated up, quickly scoring 10 of Georgia State’s first 17 points, to close that gap. Then, D’Marcus Simonds rallied the team to bring it within five points of Houston. Houston responded and ended the first half leading 40-31. There wouldn’t be any climbing back into the game during the second half for No. 14 seed Georgia State. The Panthers were outscored 45-24 in the half. Georgia State (24-10) lost 84-55 to the Houston Cougars (32-3). Four seniors, Mitchell, Jeff Thomas, Malik Benlevi and Jordan Tyson played their final games for the program. So did junior Simonds, who will declare for the NBA Draft. Houston’s Corey Davis Jr. scored 26 points and made more 3-pointers, seven, than Georgia State’s six. Georgia State made the most 3-pointers in program history this season but shot 6-of-26 from behind the arc against Houston. The Panthers only attempted 23 3-pointers, in part, because Houston defenders played the shooters tight, even off the ball. Georgia State shot 30 percent overall, its worst shooting performance of the season. Things got out of control for the Panthers in the second half. Houston went on a 13-2 run to stretch its lead to 65-41 with 10 minutes remaining. While Houston ran away with the victory, the Panthers went nearly nine minutes without a making a field goal. Simonds scored 18 points to lead Georgia State, and Mitchell finished with 12 points. Mitchell scored just two points in the second half. No other Panthers scored in double figures. Four Cougars did. Georgia State missed more than a handful of makeable layups in the game, particularly in the first half. Had those misses been makes, Georgia State’s goal heading to the second half would’ve been to take, or extend, the lead rather than to overcome a near 10-point deficit. The Cougars shot 51.6 percent in the game and began 6-of-8 when they owned a 15-3 lead less than five minutes in. They took advantage of late defensive rotations by Georgia State to get easy shot attempts. For the large majority of the game, Houston guard Corey Davis Jr. was the only Cougar to make a 3-pointer. He made all but one of Houston’s 3-pointers. 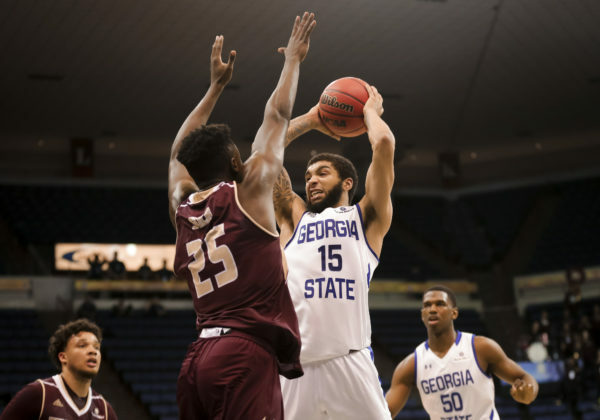 Kane Williams and Damon Wilson are key returners to a Georgia State program that has made two consecutive NCAA Tournament appearances and three in the past five years. The Panthers expect to return the tournament next season despite the exodus of production in Simonds, Mitchell, Benlevi, Thomas and Tyson.